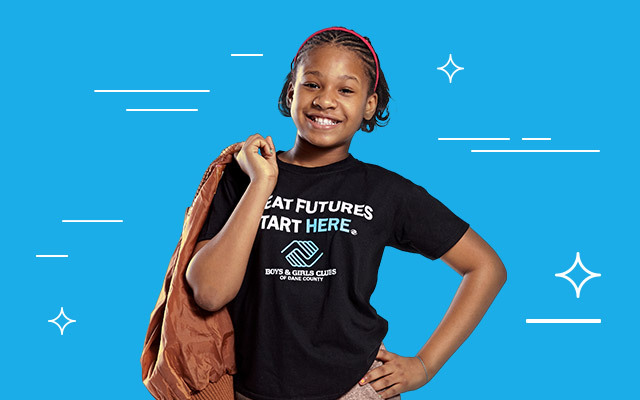 Our local center became a chartered affiliate of Boys & Girls Clubs of America, opening its doors in the south Madison community to more than 600 young people. The Club in Dane County opened a site at an apartment complex in the Allied–Dunn’s Marsh neighborhood, serving more than 1,000 young people annually. With help from the Allied Campaign, the Club broke ground for its new facility in the Allied–Dunn’s Marsh neighborhood. Community leaders raised more than $3 million to build a new Boys & Girls Club family center in the Dunn’s Marsh neighborhood and more than 1,800 kids were served on an annual basis. Our local Club began a college preparatory program at East High School in Madison. The Club expanded their college preparatory programs into all four local high schools and partnered with Centro Hispano to start academic support programs at Verona High School to support the needs of at-risk students. Boys & Girls Club volunteers raised more than $1 million over an eight-year period to support local programming through the annual Bike for Boys & Girls Club, helping to keep the doors open to more than 2,000 young people and their families seven days a week, 50 weeks a year. More than 2,100 young people were served at the local Boys & Girls Club, and 100 percent of the Club’s college prep members graduated from high school. More than 90 percent are in college as of October 2011. Club’s CEO, Michael Johnson, is named Midwest Executive of the Year by Boys & Girls Clubs of America. This is the first time a Dane County executive was named with such an honor from its national office. Also, the US Secretary of Education visits programs at East High School to highlight Club’s partnerships with the school, and Mary Burke, a long time volunteer, is given the Club’s inaugural “Life Time Achievement Award” for her years of advocacy and support to the Club as a volunteer. Club begins to focus strong on Teen Programing and creates a two hour movie called “The Club” that focuses on teenage issues like bullying, pregnancy, gangs, drugs, immigration, etc. More than 1,800 people show up to the premier and thousands of movies are sold online and throughout the country. University of Wisconsin completes third study showing that Boys & Girls Clubs kids enrolled in AVID/TOPS have higher GPAs, better attendance, and less behavioral problems. Club doubles it budget and serves 1,000 more kids. Boys & Girls Club of Dane County teenager, Sam Wright, wins National Boys & Girls Club of America Digital Media Arts Award after the Club opened a music studio at its Taft Club. The teen’s music begins being played all over the country and he performs a music video with Hip Hop Legend Run DMC at the Allied Club which makes the front page of the Wisconsin State Journal. The same year, the Club receives the Friends of Education Award from the Wisconsin Department of Public Instruction and increases programming and membership to 4,400 kids. Club receives a donation from a local developer by the name of John Livesey who leases a 6,000 square foot office space to Club for $1 per year for five years and Club then builds out a fitness facility, STEM Lab, and Credit Union at its Club locations. The same year, John and Joe Ellen McKenzie, a local couple, award the largest scholarship ever given to a Boys & Girls Club member – a $100,000 college scholarship. Additionally, Club organizes a youth summit after an officer involved shooting occurrs and more than 3,000 teens attend. Club membership grows to more than 5,000. Boys & Girls Clubs’ programming with MMSD wins national honor and is recognized as a “model” program for AVID programs across the country and receives $3.3 million dollars in grants to expand programming. Club also leads an effort to help the City of Madison create a violence prevention program and convinces the Mayor and City Council to support a city-wide violence prevention plan. This same year, Club delivers 50,000 gallons of water to Flint Michigan after crisis hits the City. Boys & Girls Clubs expand programming and announce plan to open a Dental Clinic with More Smiles Wisconsin with a gift from Delta Dental of Wisconsin. Club hits a milestone by raising more than $700,000 from its two major special events and serves more than 7,000 youth and families. This same year, Club organizes the community and leads a major effort to deliver more than half of a million dollars in cash and supplies to the victims impacted by Hurricane Irma and Harvey. Boys & Girls Clubs of Dane County and Walworth County Boards of Directors unanimously voted to become one non-profit organization. The organization will rebrand itself, realign staff positions, and increase services to young people throughout the region. Rod Mitchell, becomes the interim President and CEO of the Boys & Girls Club of Dane County. Name has not yet been chosen. Boys & Girls Clubs of Dane County welcomes Michael Johnson, the previous BGCDC CEO to continue bringing the Club’s mission and vision to the forefront of Dane County youth. Boys & Girls Clubs of America had its beginnings in 1860 with several women in Hartford, Connecticut. Believing that boys who roamed the streets should have a positive alternative, they organized the first Club. A cause was born. Several Boys Clubs decided to affiliate. The Federated Boys Clubs in Boston was formed with 53 member organizations—this marked the start of a nationwide movement. The Boys Club Federation of America became Boys Clubs of America. Boys Clubs of America celebrated its 50th anniversary and received a U.S. Congressional Charter. The national organization’s name was changed to Boys & Girls Clubs of America to recognize that girls were a part of the cause. Accordingly, Congress amended and renewed our charter. Boys & Girls Clubs of America celebrated 100 years of providing hope and opportunity to young people across the country.